The supermassive black hole at the center of NGC 5548 behaves strangely. The galaxy is about 245 million light-years from Earth. The bright center of a distant galaxy strangely and unexpectedly darkened recently, and now scientists think the culprit was a rare, powerful stream of gas blowing in front of it, eclipsing its heart. This new finding may also provide insights into the workings of supermassive black holes and how they influence their galaxies, scientists added. You can watch a video detailing the new galaxy finding on Space.com. In 2013, astronomers noticed that something eclipsed the light from NGC 5548, blocking 90 percent of the X-rays emitted by the supermassive black hole. This image shows galaxy NGC 5548, where an odd stream of gas obscured the galaxy's center. 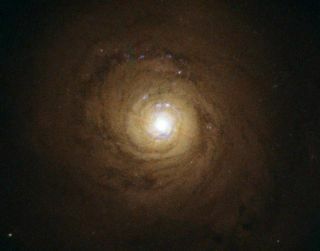 "Astronomers have been looking at this galaxy for decades, and everyone expected it to behave normally, so seeing this galaxy's center change to a completely different state was surprising and exciting," lead author of the new research Jelle Kaastra, an astronomer at the SRON Netherlands Institute for Space Research in Utrecht, Netherlands, told Space.com. To find out more about why this galaxy's core went dark, astronomers examined it with six different NASA and European Space Agency observatories — the Hubble Space Telescope, XMM-Newton, Swift, NuSTAR, Chandra and INTEGRAL — from May 2013 to February 2014. After comparing their observations to data from 2002, when nothing seemed to eclipse that galaxy's nucleus, the scientists created a model to account for the eclipse. The researchers suggest the culprit was a fast-moving and clumpy stream of gas moving up to 11 million mph (18 million km/h). "This is a fairly rare event, not seen in the decades we have been looking at it," Kaastra said. This streamer of gas began obscuring NGC 5548 sometime between August 2007 and February 2012, and has lasted sometime between 2.5 and six years. "It has traveled a distance of at least 100 billion kilometers [62 billion miles]," Kaastra said. "It probably has an elongated structure, with its width just 1 to 10 percent of its length." Although scientists had seen other galaxies with gas streams near black holes, "this is the first time we've seen a stream like this move into the line of sight," study co-author Gerard Kriss of the Space Telescope Science Institute in Baltimore, Maryland, said in a statement. "We just happened to get lucky. With most objects like this, you don't normally see this kind of event." This animation shows the wind of galaxy NGC 5548. The black hole is in the background. "This new stream is most likely gas that comes from the accretion disk, the disk of gas that is swirling in toward a black hole," Kaastra said. "This disk is turbulent, filled with all kinds of bubbles and instabilities that can launch gas from the disk." The researchers say these findings are the first direct evidence for the long-predicted shielding process that is needed to accelerate black hole winds to high speeds. Past research suggests these winds come into existence only if their starting point is shielded from X-rays — the newly discovered eclipsing stream could provide such protection. Black hole winds can be powerful enough to blow off gas that otherwise would have fallen onto the black hole. This means black hole winds can regulate both the growth of the black hole and its galaxy. "Learning more about these powerful winds can shed light on galactic evolution," Kaastra said. In the future, Kaastra said, researchers should try to find more of these powerful gas streams to find out how often they happen and learn more about what causes them. The scientists detailed their findings online today (June 19) in the journal Science.